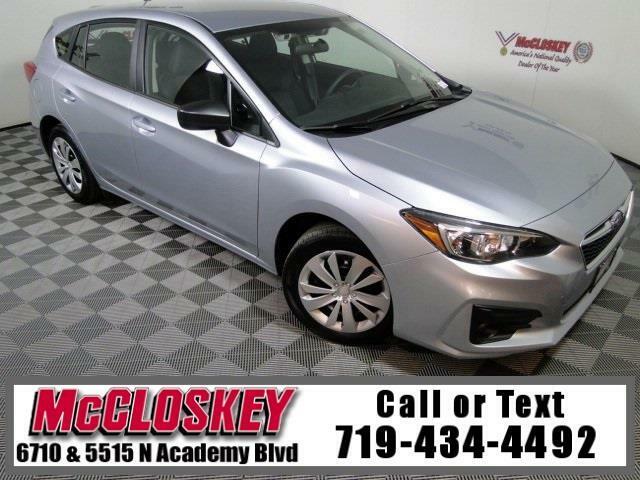 Ride with confidence in this 2019 Subaru Impreza 2.0i with Eyesight Technology, Adaptive Cruise Control, Lane Departure Warning, AUX and USB Connection! The 2.0i comes standard with 16-inch steel wheels, daytime running lights, remote locking and unlocking, cloth upholstery, carpeted floor mats, a rearview camera, a tilt-and-telescoping steering wheel, a driver information display, a height-adjustable driver's seat, cruise control, a 60/40-split folding rear seat, Bluetooth, a 6.5-inch touchscreen, and a four-speaker audio system with a USB port and Android Auto and Apple CarPlay compatibility. The available EyeSight suite of driver aids adds adaptive cruise control, forward collision warning with automatic braking, automatic reverse braking, and lane departure warning and mitigation. This option also adds an upgraded driver information display. This vehicle passed our 110 multi-point inspection and is backed by our National Quality Dealer of the Year Award. We are an ''A+'' Better Business Bureau Rated Business. We offer low interest rate financing, low down payments and the highest trade allowances in the state! Here at McCloskey we do things a bit differently, we shop our competition every day to ensure a great value to you. Come on down and experience it for yourself. This McCloskey Assured vehicle includes a 2 month/2000 mile Warranty and a Vehicle History Report!! At McCloskey we strive to provide ASSURANCE, TRUST, VALUE AND QUALITY! Call 719-434-4492. Message: Thought you might be interested in this 2019 Subaru Impreza.